Opinion: Does Triathlon have a problem? So I’ve caught your attention and interest. This blog takes us back to something which caught most of our attention last year. 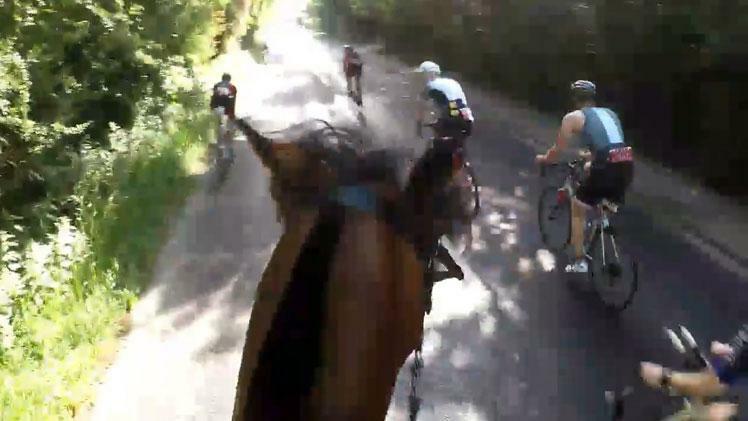 At the Royal Windsor Triathlon 2018 we all got to see first hand what happens when riders participating in a triathlon adopt a head down racing attitude to riding on the highway, nearly plowing into the back of a horse. If you’ve not seen it you can catch up here. This incident sparked a huge amount of backlash against cyclists and triathletes which overnight sparked debate across social media. Reading through the comments it quickly became apparent one set of criticisms kept reappearing. Why are triathletes allowed to race on the highway when nobody else is? Good question. When it comes to the laws with regards to cycling events on the highways there are two classes of events, races (inc. time trials) & sportive’s. Races involve road closures or controls and require permitting by the authorities. Sportives are unregulated and effectively involve people cycling as if they normally would just all following the same route. Now Triathlons as they generally exist take place on open road and are permitted as sportive’s e.g. not racing. Times are allowed to be recorded for a sportive but the fundamentals are it is not a time trial style race and you must obey the rules of the road. Now the problem with Triathlon is for a lot of people it is 100% a race and they are determined to get the best time possible. This really cuts to the heart of the sport and the short answer is I have no idea what the solution is, other than making it easier for closed road events to take place. Given the length of time most triathlons take place over I can’t see this happening. Luckily quite possibly one possible answer already exists in the sports we combine. Cycling has managed to very successfully split the definition of a race and a sportive which is reflected in legislation. Perhaps Triathlon needs to do the same and evolve beyond the existing format? Perhaps we need to also clearly divide events between closed road racing and open road sportives? It was from these thoughts that the idea of organising a sportive equivalent for Triathlon was born. Several things became clear it had to be long/challenging where the time you complete it in is less important than the experience of participating in the event. I looked at potential routes and following a number of conversations with venues & councils, Castle to Coast/ Windsor to London was born. This is my attempt to answer that question for triathletes of can we create a multi sport answer to cyclings sportive? Something that goes beyond racing and that sets a standard for other events to follow. Support has been awesome so far and this is looking to be an awesome event if not challenging from a logistical point of view. As we work through all the fine points of the event one thing really resonates on both fronts. This is not a race but an epic challenge to get right.